It's 05:56 in Huntington Beach, USA right now. 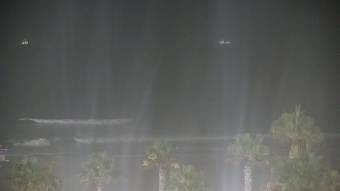 HB Pier - Northside Live streaming webcam with current surf conditions and weather forecast. Huntington Beach, California: Huntington Beach Pier, 0 miles away. Fountain Valley, California: Talbert Middle School, 4.6 miles away. Fullerton, California: California State University, 15.1 miles away. Laguna Beach, California: HD Stream Laguna Beach, 15.7 miles away. San Pedro, California: Livestream Port of Los Angeles, 16.8 miles away. Rancho Palos Verdes, California: Point Vicente Lighthouse, 22.2 miles away. Rancho Palos Verdes, California: Point Vicente, 22.2 miles away. Dana Point, California: Oceanview, 22.6 miles away.